Hi there, a week ago i downloaded me the free test version of Vue 7. ‘Pioneer’ allows you to get a sneak peak into the power of Vue 7. I know Vue since its early days and followed it eversince. Its gone down a long road and really became a name in the industry today. So i took me some time, to check out the speed a bit, and did some test renders. No exciting stuff. Just basics. 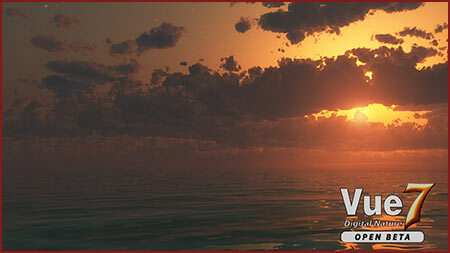 Clouds for example were a heartbreaker in the Vue 6 version. 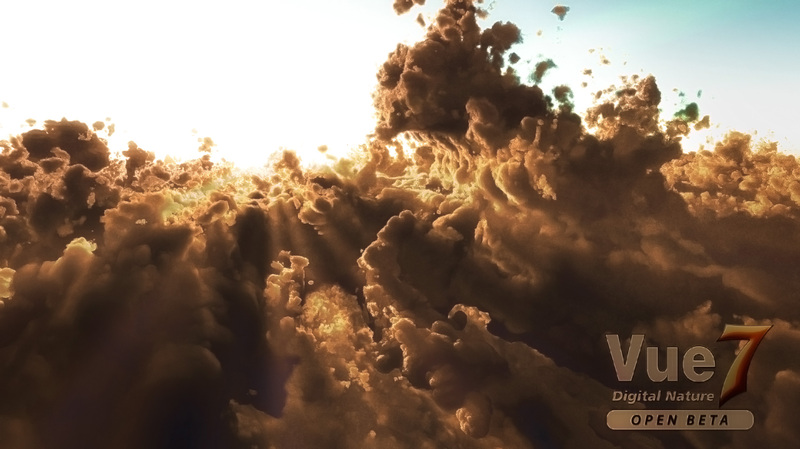 In Vue 7 they managed to create quite a speed boost when it comes to volumetric clouds. Render One – This was the first test render i did. Quality settings in Vue Pioneer are very limited. So this render is done in Ambient Occlusion and Superior Quality. Rendered on a 4gig ram, AMD 5200+ – definitely no speed machine. Rendertime was under 2hrs for 1920×1080. 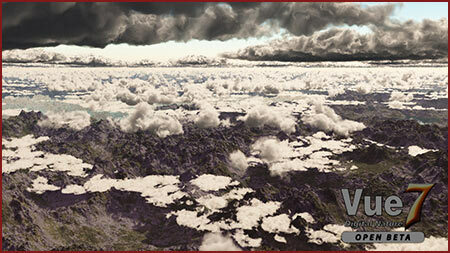 Render Two – Another test with clouds. Same setup like render one except the res was 1024×575. 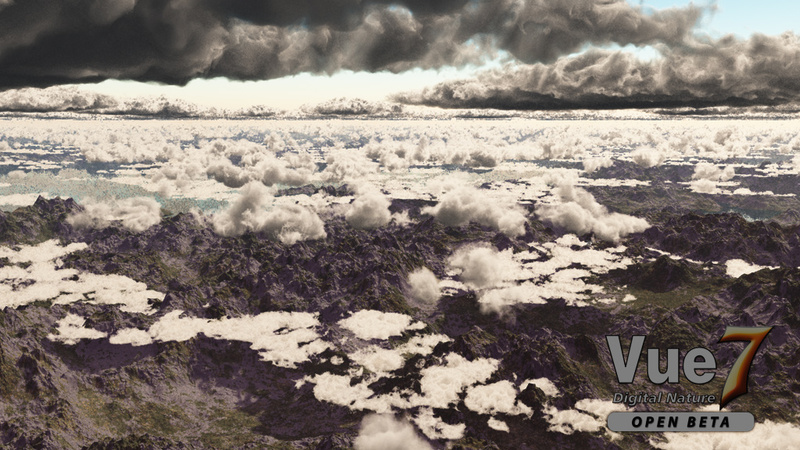 What i noticed was that vue’s render engine now seems to pre render the terrain before it goes into the details. Rendertime here was also below 2hrs. Render Three – This was a kind of thing i always wanted to create. This pic is also a bit reworked via Photoshop. I wanted to see what i can do with a minimum of effort on postwork. I cleaned up some edges and adjusted the colors a bit. Also added some slight sun beams. I rendered this on my laptop which is a bit more powerful than my work horse machine here. So this was rendered on 4gig ram and an Intel 9300 (5gh). Rendertime here was below 3hrs for 1920×1200 in superior quality. Resume: Ultimately i must say, in detail, the clouds look a bit more like foam… than actual clouds. On the other hand that is probably only a thing that people recognize that really know how clouds should look like. On alien worlds clouds could look different too. So there are enough working excuses for us artists. Hehe. The clouds, nonetheless, look quite good and surely deliver a nice base for digital matte painters. I’m pretty sure that Vue will continue to make its way. This entry was posted on Wednesday, January 28th, 2009 at 15:59	and is filed under 3D & Fractals, General. You can follow any responses to this entry through the RSS 2.0 feed. You can leave a response, or trackback from your own site. Links for image 1&2 are reversed? The images do look a bit more artificial then your usual work, but I guess it is because you spend much more time on them, I’ll look forward to see your other new work like always. fixed the links. dammit. there’s rarely a post that works perfectly without editing afterwards. :D yes these pics were tests only. i did some rough post work on the third… none on the first two renders. so yes, vue offers quite some possibilities for non studio artists like me. yup, kann sich durchaus sehen lassen.